The Jetskishop.com has been synonymous with jetski adventure touring for more than 20 years. The long-running initiative, The Breakfast Club, is a social group for jet ski owners who have a passion for discovering new destinations with personal watercraft. By organising treks to interesting destinations, the Club believes that riders can build their confidence to take others with them to exciting spots where they can discover new activities and great places for lunch. 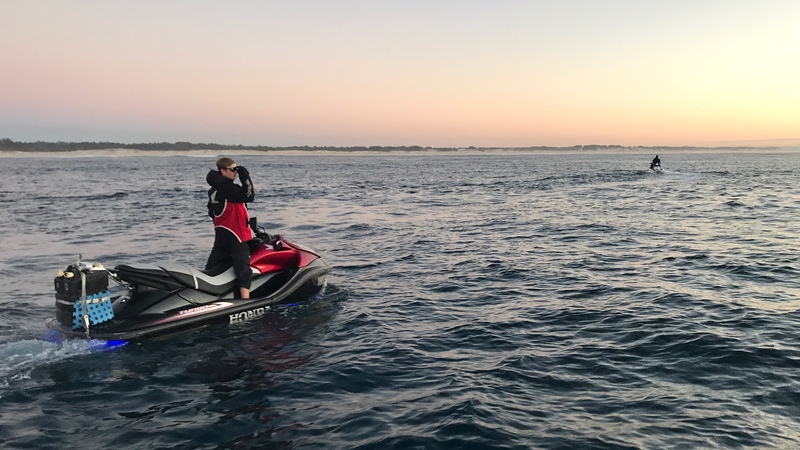 One Friday morning, before the sun rose over the horizon, Tom McNaught, The Breakfast Club president, set off with Andrew Johnston and his son Ethan, from Southport to Hervey Bay in one day – a journey of over 400km by water. “We set off from the beautiful Gold Coast, with navigation lights on. Soon after exiting the Seaway, we spotted our first whales. After a short stop to admire such majestic creatures, we continued the journey before being greeted by an amazing sunrise over the Pacific Ocean,” Tom recalls. Next destination was Noosa for their last scheduled fuel stop, before taking in the surroundings as they powered to their destination. “The scenery going past Teewah Beach and the Coloured Sands around Double Island Point was simply stunning. The waters through the Fraser Passage were as smooth as glass,” remembers Tom. Easily one of the most memorable days on the water, ever.